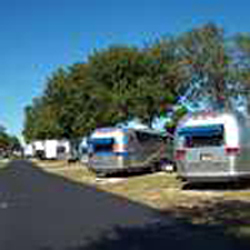 At Cypress Campground & RV Park, we offer a variety of different RV site types to our campers. This allows you to find the perfect option to fit your needs. Basic sites at Cypress Campground & RV Park have a lot size of 36 x 60, they allow for 30/50 AMP, and the RV will be on grass. Our basic sites have a picnic table and a patio plus, city water, cable, sewer, and free Wi-Fi. 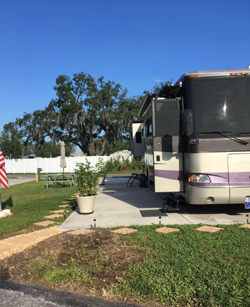 Premium sites at Cypress Campground & RV Park are corner lots that have a lot size of 40 x 60, they allow for 30/50 AMP, and the RV will be on gravel. Our premium sites have a picnic table and a patio plus, city water, cable, sewer, and free Wi-Fi. 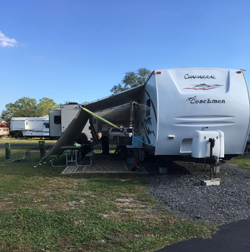 Deluxe sites at Cypress Campground & RV Park are corner lots that have a lot size of 40 x 60, they allow for 30/50 AMP, and the RV will be on concrete pads. Our deluxe sites have a picnic table and a patio plus, city water, cable, sewer, and free Wi-Fi.